MILAN, Dec 10, 2011/ — Mykita and Moncler… two brands known for their innovative take on their products. Always challenging the status quo, Mykita and Moncler are both leaders in their fields. And now, these two leaders have joined forces in a project which aims to explore new and untapped territories in the eyewear market. Inspired by Lino Lacedelli and Achille Compagnoni, who in 1954 became the first men to conquer the second highest mountain the world (K2), the newly minted LINO and ACHILLE eyewear hark back to Moncler’s history as it was the original outfitter for the expedition. Suitable both for downhill runs and also as classic sunglasses, LINO and ACHILLE are sporty as well as perfect for everyday use. The frames are inspired by the look of 1950s Alpine goggles, which featured round lenses in metal rims with leather side pieces for ultimate protection against the light. ACHILLE, with its straight top line and broad frame is the more avant-garde model of the pair, a retro-futuristic new look. LINO’s sweeping top line and slim frame make this model a modern counterpart to the glacier snow glasses of yesteryear. The swept-back frame edge in both unisex models reflects the look of that era; the original leather sections on the sides and bridge to protect against the glare are today revisited via the flared frames. A critical factor for the design process was the new material MYLON, developed and patented by MYKITA after years of research. Red and blue are a throwback to the first Moncler down coats that were originally sold in those colours in the early 1960s. Both models are available in the colours Red/Red flash mirror, Blue/Blue flash mirror as well as in a classic Black/Black flash mirror, in each case with mirrored lenses in the same colour or alternatively with solid grey-tinted lenses. All lenses reveal the MYKITA & Moncler logo when breathed on. An anti-fog finish on the inside of the lenses plus an anti-scratch outer coating make these spectacles a top-calibre sporting companion. The glasses come with a padded sleeping bag style carry pouch for easy transport in addition to a black glasses case and box. 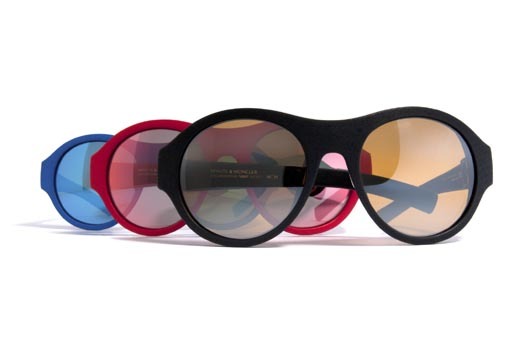 The models comprising the MYKITA & Moncler collaboration are available by Mid December 2011 only at MYKITA shops and Moncler boutiques worldwide.